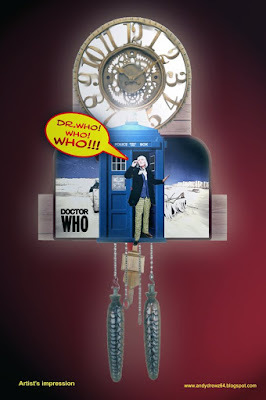 Andydrewz's Pages: Sydney Newman's Dr Who Cuckoo Clock...!! 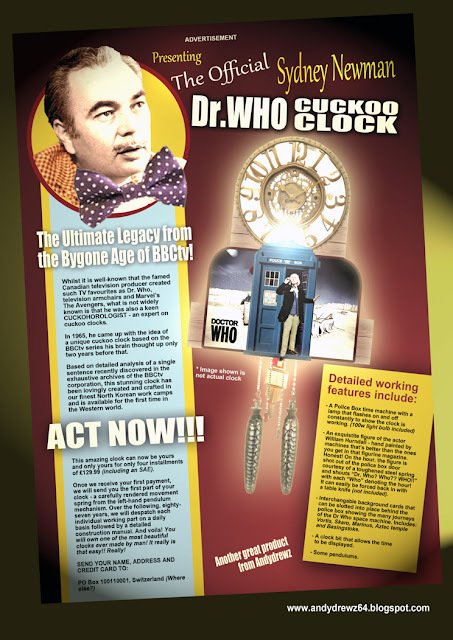 Richard Bignell [@NothingLane] - who should be familiar to Doctor Who fans from his 'Now & Then' features on the BBC Doctor Who DVDs and from being one of DWm's original 'Time Team' tweeted a scan of a 1965 BBC memo from Sydney Newman. In it, Newman thanked the "Asst. to H.B.Tel.E" (?) for a list of merchandise based on his beloved Doctor Who. He was, however, disappointed to discover that a licenced cuckoo clock was not on the list... "Where are they?" he asked. Well, Mr. Newman... Over fifty years late but here they are.